Froggy has never celebrated Christmas! Every year he dreams his way through winter, and wakes up just in time for spring. But this year, his friend Max wakes him up early so that they can have some holiday fun. 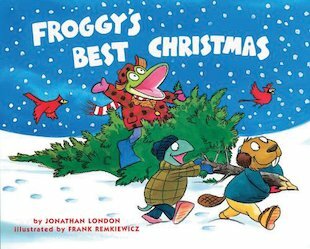 Along with their friends, they find and decorate the perfect tree… but when Froggy reaches up to put the star on top, things go a little awry. All the same, Froggy’s hilarious antics make for the merriest Christmas ever – filled with presents, roasted chestnuts and even a snowball fight!